I thought I’d take some time to do something that I’ve been thinking about for a while now. See, if you look at a lot of the workbenches on Lumberjocks.com you’ll see some real craftsmanship and a lot of artistry. But these guys use wood like oak, maple, cherry, walnut, etc. Don’t get me wrong….if I had the choice I’d make mine out of maple and cherry and walnut in a New York second. However in my situation, using hardwoods is just too expensive. It’s pretty ironic that when someone is just starting to make sawdust and needs a bench he or she likely won’t have the tools or more importantly, the experience to build something worthy of the wood used. Which is my point: softwoods like pine can make decent benches. Especially for noobs like me who had some basic tools, and nothing much else but a willingness to work hard. Softwoods are cheap (which in my book gets the highest consideration), readily available (again, big props there) and easily worked with basic tools. The downside is they are…well…uh, soft. Dents, dings, scratches, chips….you can expect all of these and more when you make a bench out of softwoods. And that is the genius of pine. Yep, it can get pretty beat up, pretty quick. But, you can also repair it pretty quick and pretty cheap. And if you pay even a little attention to what you’re doing (I’m talking to you, yeah, the one rockin’ out to Aerosmith while trimming boards and thinking about steaks for dinner), you not only avoid hurting you bench (and possibly your workpiece or yourself) but you gain an awareness about your tools, workpiece and bench that becomes second nature and can help you avoid mistakes later on. Well, that was a lot of wind to introduce this entry. I suppose I could have simply said, hey, all you guys out there trying to decide on what bench to build, lookie here: here’s what a pine bench looks like after a decent amount of use and abuse, a year after a rookie made it. But besides woodworking, I’m a writer, so….I like writing. Oh whatever, just keep reading. Ah well, it worked. And I still have all my fingers! I have had no structural issues with using pine for the top. 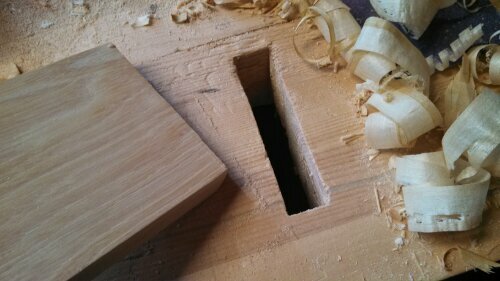 I hacked (mortised is too fancy a word for the “job” I did on that) a slot for a planing stop….that is something I would not recommend in the future. It worked…but the stop is hickory—-maybe too dense a wood for this purpose, because the pressure from planing against it has caused the hickory to widen the gap and now drops right through the bench. 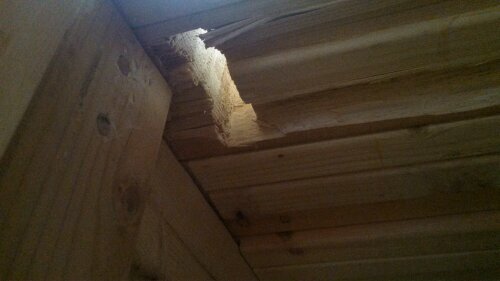 Readers of my blog (all six of you) know that I didn’t flatten the underside of the bench. Does that matter though? Aesthetically, yes. Practically? Well….yes. At least for the first couple planks in the front. 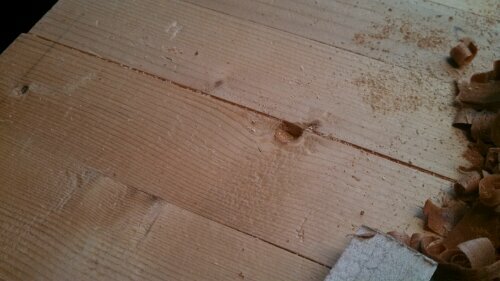 Using clamps would be easier if there weren’t bumps and ridges between the 2x4s underneath to deal with. It’s much more evident on the ends….it’s not work prohibitive, just irritating. Like sitting in something wet. You can still shingle a house in wet pants, but you may be in a worse mood for it. 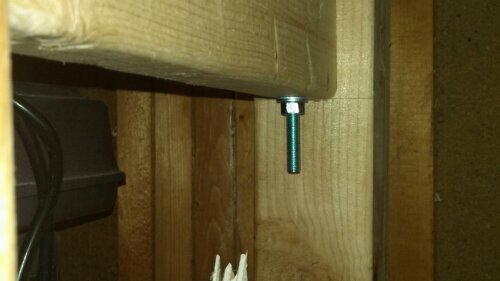 Speaking of minor irritations, I mounted some rails for my sharpening system (a piece of MDF that holds sandpaper sheets) under the bench top to keep it clean, safe, and handy. My mistake was not mounting it far enough back from the front edge. Yeah, it works and I was proud of my cleverness. Yeah, I can still clamp things right at the edge, but if I don’t take a second to twist the clamp just so, the sharpening jig bumps the clamp handle resulting in a loose clamp and skinned knuckles. My options now are to slice off part of the jig (does it really need to be that wide? ), move the rails further back (ugh…getting under there was fun enough the first time) or just deal with it a little longer and switch to oil stones (which I am slowly acquiring). So, lesson learned. Flatten underneath, at least all around the edges and front. You’ll notice the lack of dog holes in the top (there’s two in the front for a board jack that have come in handy). That’s because I don’t have a wagon/tail vise and without a hold fast, I haven’t really needed any yet. However, I have plans for making my own hold downs so more on that later. 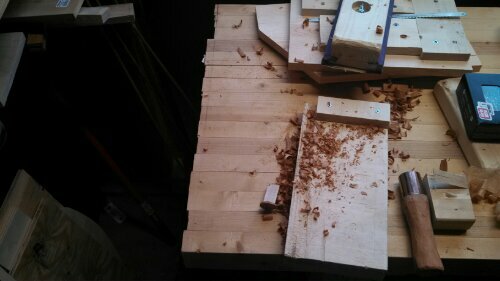 I assume that if I did have dogholes, properly chamfered, they would hold up as well as the rest of the bench. Speaking of chamfers, I broke the sharp edge at the front of the bench with a block plane and some sandpaper a while and it has held up really well. No tear outs no dongs, no dents. Just a clean, rounded, comfortable yet square enough for working edge. All in all, I am pretty well pleased with how the top has held up. No twisting, cupping or warping (beyond what was there when I “completed” it). I got the thing to about 95% flat before I started using it. On my someday list is to take the random orbit sander to it and get it good and flat. But, I’m also contemplating just making a new one….now that I have learned from my mistakes. We’ll see. What else? Well, the top is secured to the base via four big carriage bolts counter sunk into the surface, then hidden by 1″ oak dowels trimmed flush. I have had to tighten the bolts under he top maybe 4 times in the past year. Not too bad at all. 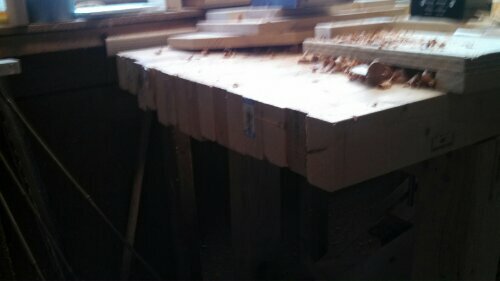 The top is still smooth, flat (mostly), stable and heavy enough for planing without the bench walking away from me. 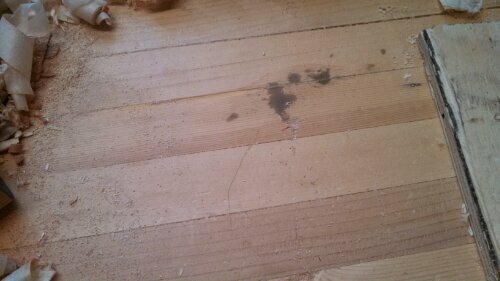 So on the whole, I can heartily recommend laminated pine 2x4s (note this is NOT the fabled southern yellow pine much espoused by The Schwarz…I would have used that in a heart beat were it available). So feel confident fellow noobs, and build your first bench out of pine if you want. Build your skills and tool arsenal and learn while you do it. My whole bench cost me $95 (including $15 for the leg vise). By bolting the top down to the base, I can easily take it off and make another, bigger, and better. If I want. More importantly, I don’t have to worry about screwing it up because it can be replaced/repaired so easily. Taking that pressure off a new woodworker is a huge bonus. Now I’m free to push myself and my skills beyond my limits without that distracting little voice in the back of my head warning me not to mess up…. Anyway, stay tuned….next time I’ll show you how other parts of the bench have held up over the past year. 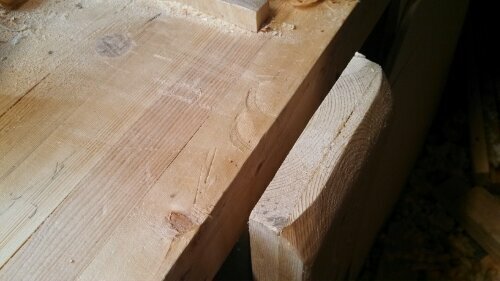 My hope is that someone like me (last year) will stumble on this blog and be convinced that pine is not bad for a bench and get cracking on making their first bench. Without this bench, the projects I completed in the past year, from building bookcases for my kids, to shaving the ends off doors for the closets, this bench has been an invaluable tool for our house. I encourage you in the strongest way, if you don’t have one, build one! 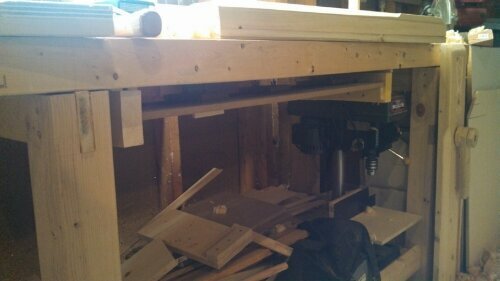 This entry was posted in Tool Review, Workbench and tagged laminate, pine, review, workbench. Bookmark the permalink.